Why does the market seem to love Garmin more than GoPro? GoPro (NASDAQ:GPRO) and Garmin (NASDAQ:GRMN) don't initially seem like competitors. GoPro sells action cameras, and Garmin sells GPS devices and fitness trackers. However, Garmin started competing against GoPro when it launched its VIRB action cameras back in 2013. Investors seem to prefer Garmin's diversified business over GoPro's. Garmin rallied nearly 30% over the past 12 months, while GoPro declined by more than 30%. Does that disparity indicate that Garmin is a better investment than GoPro? Let's compare both companies' business models, growth trajectories, and valuations to find out. GoPro's Hero 5 (L) and Garmin's Virb X/XE action cameras (R). Image source: Company websites. How do GoPro and Garmin make money? Most of GoPro's revenue comes from three action cameras -- the Hero 5, the Hero 5 Session, and the Hero Session. Additional revenue comes from accessories for those cameras -- which include the Karma drone, Grip stabilizer, and various mounts. GoPro doesn't disclose how much revenue each type of camera generates, but its total camera unit shipments fell 28% to 4.76 million in fiscal 2016. Garmin's business is split into five main segments -- outdoor, fitness, marine, aviation, and auto devices. The outdoor business sells pricier GPS sports watches, the fitness business sells cheaper fitness trackers, while the marine, aviation, and auto units provide GPS devices for those specific markets. Its action cameras, which can be used as dash cams, are included in its auto business. The outdoor, fitness, marine, and aviation businesses all posted double-digit sales growth in fiscal 2016, which offset ongoing smartphone-induced declines at its auto business. How fast are GoPro and Garmin growing? GoPro's top-line growth has slowed dramatically because of slowing upgrades from existing users, cheaper action cameras flooding the market, and improved smartphone cameras rendering standalone cameras obsolete. That's why GoPro's revenue fell 27% to $1.19 billion in 2016, compared with 16% growth in 2015 and 41% growth in 2014. Analysts anticipate just 7% sales growth this year and 3% growth next year, even though GoPro added new products such as the Karma and Karma Grip to its lineup and is trying to generate additional cloud subscription revenues with its GoPro Plus service. Garmin has been pivoting away from its slumping auto business, which still accounted for 29% of its sales in 2016. That unit's 17% sales decline during the year offset much of the growth in its other four businesses, which caused its total revenues to rise just 7% to $3.02 billion for the year. But looking ahead, the weight of the auto business will probably shrink as the weight increases in the high-growth outdoor and fitness units, which together accounted for 45% of its 2016 sales. Analysts expect Garmin's revenue growth to stay roughly flat this year before rising 2% next year. Which company is more profitable? GoPro is struggling to balance the costs of developing new products and services, being aggressive with marketing pushes, and competing with cheaper devices. That's why its operating margin remains deeply negative, and why it announced three rounds of job cuts over the past year. 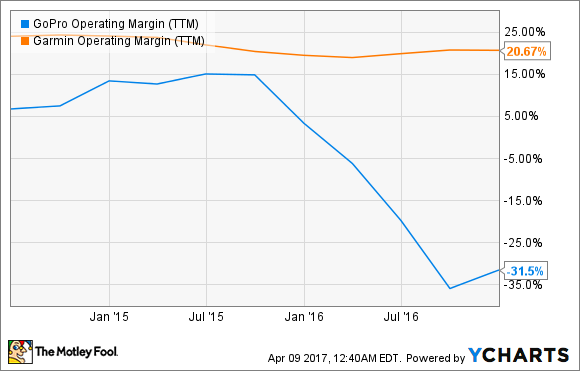 Garmin hasn't struggled with the same issues -- that's why it consistently reports double-digit operating margins. GoPro posted a steep full-year loss in 2016, but it hopes to achieve non-GAAP profitability this year by cutting costs and launching new products. Wall Street doesn't seem as optimistic and expects a narrow loss this year before a return to profitability in 2018. Garmin has been consistently profitable, but its growth has been lumpy because of the costs of pivoting away from its higher-margin auto business toward lower-margin wearable devices. Its lower-end Vivoactive devices face tough competition, but Garmin is addressing that challenge with robust sales of its pricier Fenix smartwatches. Garmin's earnings rose 14% in 2016, but they could slip 7% this year before rising 3% in 2018. Garmin's consistent profitability enables it to pay a hefty forward dividend yield of 4.1%, which is comfortably supported by a payout ratio of 76%. Garmin has also raised that dividend annually for five straight years. GoPro probably won't pay dividends anytime soon. GoPro's trailing P/E remains negative because of its lack of profits, but its enterprise value-to-sales ratio of 0.8 looks fundamentally cheap. Garmin has a much higher EV-to-sales ratio of 2.8, but its trailing P/E of 19 is much lower than the S&P 500's average P/E of 25 and the industry average of 43. Based on these comparisons, it's obvious that Garmin is a better investment than GoPro. It has a better diversified business, it has stronger top- and bottom-line growth, and it's successfully pivoting away from a slower-growth market toward higher-growth ones while paying a solid dividend. As for GoPro, the company must present a clearer road map for its growth -- besides half-hearted entries into drones and virtual-reality rigs -- before it wins back long-term investors.